Manufactured under pharmaceutical standards and inspected by "the Danish Food and Drug Administration"
Research indicates that people who consume cholesterol-lowering statins may also benefit from taking Bio-Quinone. Bio-Quinone’s supportive role in heart health was demonstrated in the groundbreaking Q-Symbio1 and KiSel-102 clinical trials – both published in esteemed cardiology journals. Bio-Quinone Active CoQ10 GOLD consists of softgels with 100 mg of CoQ10 in the form of active ubiquinone dissolved in vegetable oil. The lightproof softgels are proprietary and developed exclusively to optimize the CoQ10 delivery in the body. Bio-Quinone's proprietary production method ensures superior bioavailability of CoQ10 without the presence of crystals at body temperature. Because of Bio-Quinone's documented quality, absorption and safety, the product has been selected as the official science reference product of the International Coenzyme Q10 Association (ICQA). For decades, Bio-Quinone has been one of the world’s highest selling Q10 brands. One of the main reasons for its popularity is the documented high bioavailability. CoQ10 is very difficult for the body to absorb. Because of Pharma Nord's proprietary manufacturing methods, in which CoQ10 is dissolved in a vegetable oil solution and exposed to a patented heating process, the CoQ10 crystalline raw material is dissolved completely to single molecules at normal body temperature. This proprietary production method ensuring that the CoQ10 is dissolved completely at body temperature is the reason why Bio-Quinone can deliver superior bioavailability of its active compound. CoQ10 is generally considered an extremely safe substance. Clinical studies have been conducted with dosages of CoQ10 ranging up to 1,500 mg/day without registration of serious adverse side effects4. Studies show that long-term supplementation with CoQ10 does not affect the body’s endogenous production of the substance5. Bio-Quinone's safety is documented through more than 20 years of clinical trials and consumer experience. Pharma Nord has spent more than 25 years developing and optimizing Bio-Quinone CoQ10 for the sole purpose of producing a CoQ10 preparation which can scientifically document its superior bioavailability and quality. These targeted efforts are the reason why Bio-Quinone CoQ10 today is the most sold CoQ10-brand in Europe and is also the CoQ10 preparation, that is officially used in international CoQ10 research represented by the International Coenzyme Q10 Association (ICQA). Bio-Quinone CoQ10's oil formulation provides higher bioavailability than other formulation. CoQ10 is a fat-soluble substance which is difficult for the body to absorb. However, thanks to a highly specialized manufacturing process where CoQ10 is dissolved in a vegetable oil solution and exposed to a patented heating process the CoQ10 molecules are able to dissolve entirely at normal body temperature. The fact that the CoQ10 molecules dissolve completely in this product due to its unique preheating process, is the reason why Bio-Quinone Active CoQ10 can deliver such superior bioavailability of its active compound. A low quality composition typically contains a mixture of CoQ10 crystals and oil, which results in poor bioavailability of the substance. Bio-Quinone CoQ10 has undergone a special heat treatment that changes the crystal structure to something similar to "snowflakes". These "snowflakes" are dissolved completely at body temperature, thus forming a uniform (homogeneous) mixture that the body can easily absorb. It is not only the formulation of the preparation that determines how much CoQ10 the body absorbs. It also depends on the dose and the dose intervals. Data from a total of seven different human studies have shown that if you take two daily doses of CoQ10 at 100 mg each, you get a higher bioavailability than when you take a single dose of 200 mg.
Bio-Quinone Active CoQ10 contains 100% natural CoQ10. The raw material is fermented by yeast, and is identical to the CoQ10, which is found in the body. In contrast to bacteria-fermented CoQ10, yeast fermented CoQ10 contains no impurities of unknown nature. The raw material is also completely free of the dangerous cis-isomers, often found in cheap synthetic CoQ10 raw materials of low quality, which is normally produced from waste products from the tobacco industry. All raw materials used in the Bio-Quinone Active CoQ10 undergo an extensive quality control before production of each batch. All Pharma Nord's dietary supplements are not only produced according to cGMP (current Good Manufacturing Practice) and Critical Control Points (HACCP), but in fact according to the guidelines for production of medical drugs. The entire Pharma Nord production meets the strict quality rules that belong to these schemes. Every step of the production process takes place under full quality control. Everything from mixing of raw materials and packing of the finished goods to transport of the products is continuously point-checked to ensure that there is complete control with the content of each softgel right until the moment when the customers receive the products. Coenzyme Q10 is a very safe substance. There have not been registered any serious unwanted effects from supplementation in controlled trials, even at doses of 1200 mg daily for one year 4. Also more than 20 years of research and consumer experience support the safety of Bio-Quinone Active CoQ10. After discontinuation of supplementation the body's Q10 level will return to the same level as before the start of the supplementation study. This shows that CoQ10 supplementation does not affect the body's own ability to form the substance . Many people use coenzyme Q10 daily, but are perhaps not aware that there can be large differences in the products. More than 20 years of consumer experience in The EU Yes ? Scientific evidence of bioavailability Yes ? Scientific data on safety Yes ? Scientific evidence of effectiveness Yes ? Reference product for The International CoQ10 Association (ICQA) Yes ? Produced in Denmark under cGMP control after drug standardisation regulations Yes ? Nature Identical CoQ10 - ie. Identical to the form the body produces Yes ? Tested and proven in more than 70 scientific studies Yes ? Documentation that the product does not affect the body's own production of CoQ10 Yes ? Used daily by thousands of consumers in more than 40 countries Yes ? A unique matrix of oil and heating method ensures that the CoQ10-crystals are dissolved in the stomach and can be absorbed Yes ? Bio-Quinone Active CoQ10 is the first CoQ10 product in the EU and contains easily absorbable CoQ10, which helps produce energy in body's cells and thus reduces fatigue and lassitude and contributes to healthy blood vessels. All Pharma Nord's products are based on thorough scientific research. Pharma Nord's own research department is continuously working to be fully up to date on the latest knowledge within the field of health and nutrition. This requires a careful monitoring of the research progress and also planning and carrying out of investigations of Pharma Nord's products in cooperation with the leading CoQ10 experts in the world. One of the latest studies done with Pharma Nord's CoQ10 was the Q-Symbio study. Professor Sven Aage Mortensen from Rigshospitalet in Copenhagen and his colleagues in EU and Asia presented the results of the Q-symbio study for the first time at a congress of cardiologists in Lisbon, Portugal, 23 - 28 May 2013. 420 patients from nine different countries were included in the Q-symbio study who examined a group of persons with low levels of CoQ10. The active treatment consisted of a soft gelatin capsule with 100 mg of CoQ10 three times a day for two years. The intention of the study was to show how well those who got CoQ10 performed compared to those who received placebo capsules. Last year we learned the results of another clinical trial with healthy elderly, the so-called KiSel-10 study, where Dr. Urban Alehagen and his team used the same Pharma Nord CoQ10 product combined with the selenium product SelenoPrecise® – and with similar results. Why CoQ10 from Pharma Nord? Researchers prefer Pharma Nord CoQ10 because the product is documented from more than 90 scientific studies, also including documentation for high bioavailability and safety. It is manufactured under Danish pharmaceutical control and is the official reference product of the ICQA (the International Coenzyme Q10 Association). CoQ10 (also known as Coenzyme Q10, CoQ10 or simply Q10) is a vitamin-like substance with a central role in the cellular energy metabolism. CoQ10 contributes actively in the conversion of fat, carbohydrate, protein and alcohol to ATP (adenosine triphosphate), a molecule that stores energy in its chemical form. When a cell needs energy, it breaks down the ATP molecule and releases the energy trapped inside. The entire process takes place inside the cells in some small bean-shaped structures called mitochondria. Muscle cells are particularly dependent on large amounts of energy, which is why muscle cells contain substantially more mitochondria than other types of cells. The heart muscle is a good example of body tissue with cells that contain a large number of mitochondria and have a correspondingly large energy requirement. Human beings are able to synthesize CoQ10 in the body. The process, which takes place in the liver, slows down as we grow older and as a result of disease. According to experts, the body’s CoQ10 levels peak at the age of 19-21 years from which point the production increasingly slows down over time. Science has not been able to quantify exactly how much CoQ10 is provided by means of the diet, but it is estimated to be somewhere around 5-20 mg daily. The body has a CoQ10 reserve that amounts to about 1 – 1.5 grams. The highest concentrations are found in the heart, liver and kidneys. Pharma Nord has spent more than 20 years documenting the absorbability, effectiveness, and safety of the product Bio-Quinone CoQ10. But many CoQ10 products are currently sold without any documentation which may give the user assurance of an effect. In the wake of this a number of claims has emerged about what kind of CoQ10 is best. A team of U.S. Researchers has reviewed and weeded out the false claims. 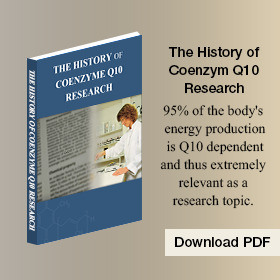 What remains are the facts about the effect and use of CoQ10. Optimum absorbability has been the keyword in the development of Bio-Quinone CoQ10, and this is documented in approx. 40 scientific studies. One of the biggest challenges associated with CoQ10 as a dietary supplement is that the substance is not generally readily absorbed by the body. CoQ10 in other words, has a low bioavailability. The CoQ10 molecule is a relatively large molecule and this is the main reason for its poor absorbtion in the body and as a result of its molecular structure, it is fat soluble. CoQ10 is absorbed in the intestinal wall along with fat and is then transported by the lymph vessels to the subclavian vein, where it is emptied into the venous blood. This slow mode of transport results in a maximum concentration of CoQ10 in the blood 6-8 hours after ingestion. Therefore, it is preferable to take CoQ10 with breakfast or perhaps lunch. If you take more than 1 softgel capsule daily, the effect is larger by spreading the dose throughout the day - ie. one capsule at breakfast and one capsule at lunch time - rather than taking the daily dosage at once. A Bio-Quinone CoQ10 capsule contains a special oil matrix in which the substance CoQ10 is in a molecular form. The starting point for all products is the CoQ10 raw material consisting of crystals, which in practice are not absorbed by the body. CoQ10 must be dissolved into single CoQ10 molecules before they can be absorbed. Less than 1% of CoQ10 is absorbed from products solely consisting of crystalline CoQ10, typically tablet products and hard capsules using unprocessed CoQ10 crystals. The crystals may be dissolved by using a special oil mixture, and a subsequent heating method, thereby, releasing CoQ10 into single molecules, which provides a quick and good absorption with oil. A marketing strategy has been based on claiming that it is better to make CoQ10 water soluble, but neither a change to the CoQ10 molecule or placement of the fat-soluble CoQ10 molecules in liposomes (small spheres with an outer fatty membrane and an inner aqueous membrane) or linking CoQ10 to micelles (small spheres with a fatty core and a water-loving surface) or attaching nano-particles to CoQ10 will make the CoQ10 molecule more water soluble. If you try, you just end up with an even bigger CoQ10 molecule complex, but no increased bioavailability and the CoQ10 molecule will still predominantly be fat soluble. If you choose to go the opposite way and make the molecule smaller, this will surely make the molecule more water soluble and more absorbable. However, such a reduced molecule will no longer be CoQ10, but would be reduced to CoQ9 or CoQ8 which are of no value to humans. CoQ10 is found in two forms. An oxidized form called ubiquinone as well as a reduced form called ubiquinol. Ubiquinol is sometimes promoted as active CoQ10, although ubiquinol is in no way more active than ubiquinone. The form of CoQ10 we produce in our cells, is the oxidized ubiquinone. Also CoQ10 from our food is predominantly the oxidized form. When we absorb the oxidized ubiquinone from the intestine it is automatically converted into reduced ubiquinol. In the blood and lymphatic system 90-95% of CoQ10 is in the form of ubiquinol. In the cells' energy-producing mitochondria CoQ10 alternate continuously between these two forms, a feature that is crucial for CoQ10's effects in the body. Therefore, it is of minor importance what form of CoQ10 you consume, your body will still convert the oxidized ubiquinone to reduced ubiquinol. To date, almost all documentation on efficacy and safety are done with the oxidized form, ubiquinone. There are up to 25 million statin users in the United States. Research has shown that around 10% of these persons could be suffering from side-effects, which can include muscle aches, joint pain and fatigue. In other parts of the world statin manufacturers are obliged to state that statin drugs may impact our natural CoQ10 production. Statins are a class of cholesterol-lowering drugs that work by inhibiting the enzyme HMG-CoA reductase, which plays a central role in the liver's synthesis of cholesterol. Randomized clinical trials (RCT) show that statins are most effective when given to patients who already suffer from cardiovascular disease (CVD). They are, however, also widely used for people without CVD, who suffer from elevated cholesterol levels and/or other risk factors like diabetes and hypertension. There are many different types of statins, some have a more potent LDL-lowering effect than others. Statins inhibit the enzyme HGM-CoA reductase and its ability to produce mevalonate, which is an intermediate product in the multi-step synthesis of cholesterol. In what is often referred to as the mevalonate pathway, mevalonate would under normal circumstances undergo a number of biochemical transformations, eventually causing it to branch into several different compounds, including cholesterol and ubiquinone. Statins effectively block this process. Since CoQ10 and cholesterol are both synthesized from the same substance, mevalonate, this implies that if the body's production of cholesterol is reduced by a statins, the body's production of CoQ10 is reduced accordingly. CoQ10 has multiple effects on the body's cholesterol level. CoQ10 will lower the body's cholesterol levels marginally. In addition, the antioxidant effect of CoQ10 will prevent circulating cholesterol from oxidizing and thereby becoming harmful. Dissolved in vegetable oil in soft gelatin capsules. * DV = Daily Value. † = Daily Value not established. One (1) Softgel Capsule 1-3 times daily, unless otherwise advised. Do not chew the capsules, but swallow them whole, preferably during/after a meal. Soy bean oils, gelatine (bovine), glycerol, glycerol, d-alpha-tocopherol, iron oxide(color). 1 - Is CoQ10 on the Doping List? Because the body produces CoQ10 of its own and because there is CoQ10 in almost any diet, it is seemingly impossible to categorize supplementation with CoQ10 as doping. CoQ10 acts as a coenzyme (supporting enzyme) in the cells and thus also in the muscles' energy producing mitochondria. We can produce some CoQ10 in the liver, and, in addition, we get minor amounts of CoQ10 from the diet. Many athletes do take supplements of CoQ10 to counteract declining CoQ10 levels, and the CoQ10 supplements are not categorized as doping. Furthermore, as part of the safety documentation for our CoQ10 preparation, Pharma Nord has had its CoQ10 tested by the Hungarian Doping Institute for possible doping-like effects and can provide a certificate attesting to its CoQ10’s lack of doping properties. This certificate is intended mostly for athletes who need to know exactly what they are consuming. 2 - What Kind of CoQ10 is Best Absorbed? To date, more than 40 scientific studies have been published, showing that, once it has been absorbed, the ubiquinone form of CoQ10 has a relatively good bioavailability and efficacy. However, not much evidence has been published on the bioavailability and efficacy of QH (ubiquinol). Various CoQ10 products are available either as tablets or as capsules. The CoQ10 content may be in the form of crystals or granules, encapsulated in liposomes, in micelles attached to nanoparticles or dissolved in oil. The size alone of the CoQ10 molecule - it has a considerable size, approx. 5.5 nm long and 864 times heavier than a hydrogen atom - means that CoQ10 is basically not an easily absorbed substance. The CoQ10 raw material is an orange brown crystalline powder, and these CoQ10-crystals cannot be absorbed directly into the body. The absorption of unprocessed CoQ10 powder is less than 1%. In addition, CoQ10 is a fat-soluble substance that has to be absorbed in the small intestine along with fat. It is possible to attach other substances to the CoQ10 molecule that will make it somewhat more water-soluble, but doing so will make the big CoQ10 molecule even bigger, whereby the advantage disappears, and the CoQ10 complex will still largely be fat-soluble. It sounds impressive to state that a CoQ10 product is three times more absorbable than a competing product, but if the competing product simply consists of CoQ10 crystals with a less than 1% absorption rate, the claim is not particularly impressive. Producers of CoQ10 supplements have to treat the CoQ10 raw material in a special way in order to achieve an effective absorption. The most bioavailable CoQ10 products are dissolved in a vegetable oil in which the crystals must be dissolved completely. 3 - Why can I not Feel the Effect of CoQ10? Most people will experience an effect of CoQ10 supplementation, either directly or indirectly. An example of the latter could be that you suddenly forget to take your usual nap. 4 - How do I Make the Most of my CoQ10 Product? Since CoQ10 is a fat-soluble substance, it is important to take it with a meal that contains some fat. The effect is observed after a short-term use and is felt most acutely approx. 6 hours after ingestion. Therefore, CoQ10 should most effectively be taken with breakfast, perhaps lunch. If you take more than 1 capsule of ubiquinone per day, the absorbability will be larger if you spread the dose throughout the day – i.e. 1 capsule at breakfast and 1 capsule at lunch time - rather than taking the entire daily dose at once. Furthermore, you can take a supplement of the amino acid carnitine, which interacts closely with CoQ10 in the cells' mitochondria. Carnitine helps with the transport of fatty acids into the mitochondria, and CoQ10 is involved in the oxidation process that converts these fatty acids into energy in the form of ATP. 5 - How do I Optimize the Body's own Production of CoQ10? It is possible to increase the body's own production of CoQ10 by exercising and by optimizing the intake of nutrients. The cell's production of CoQ10 is a complex process involving many biochemical steps. In order for the body to produce CoQ10, there is a need for a vitamin B complex, vitamins C and E, selenium and magnesium and several trace elements. A lack of one or more of these nutrients will affect the body's CoQ10 production considerably. An increase in available CoQ10 in the body will usually be larger with the aid of even a small daily supplement of CoQ10. 6 - What are the Best Dietary Sources of CoQ10? Cereal products usually contain Coenzyme Q9, whereas soybeans do contain some CoQ10. There is also some CoQ10 in walnuts, almonds, oil-rich fruits and green vegetables, especially spinach. Furthermore, fish contains CoQ10, especially sardines, which contain twice as much CoQ10 as beef. Even so, one would have to eat one pound of sardines, two pounds of beef, or 2.5 pounds of peanuts in order to get 30 mg of CoQ10. Typically, there is somewhere between 5-10 mg of CoQ10 in the food we eat on a daily basis. Most individuals probably get around 5 mg a day. 7 – Are There Adverse Effects from CoQ10? In studies in which CoQ10 has been tested, daily doses up to 1500 mg have not caused adverse effects of a serious nature. There have only been a very few cases of adverse effects of a mild nature. Symptoms like headache, dizziness, nausea, constipation, diarrhea and indigestion can occur in rare instances. It cannot be excluded, however, that some of these symptoms may originate from the capsule material or added vegetable oil, and not from the CoQ10 itself. 8 - How Long can I take CoQ10? CoQ10 is generally considered a very safe substance. Long-term studies of more than 5 years as well as studies with high daily doses have shown that it is safe to take supplements of CoQ10 for a long period. In addition, supplementation of CoQ10 does not reduce the body's own production of the substance. After cessation of supplementation, the body's CoQ10-level returns to the same level as before. This is proof that CoQ10 supplementation does not affect the body's ability to synthesize it. Everything indicates that you can safely continue to take CoQ10 for life. 9 - What is the Difference between Qxidized CoQ10 (Ubiquinone) and Reduced CoQ10 (Ubiquinol)? CoQ10 is a redox molecule. It is best known for its oxidized form, ubiquinone, which is the only kind of CoQ10 that has been available as a supplement ever since the first CoQ10 preparations were introduced in Europe shortly after 1990. Globally, ubiquinone has also been the only form of CoQ10 whose effect has been documented in scientific studies, until the introduction of ubiquinol. Ubiquinol, the reduced form of CoQ10, was first brought to the market in 2006. Since then, ubiquinol has been marketed as active CoQ10 although it is not more active than ubiquinone. All in all, there is not much scientific evidence on ubiquinol. In other words: Almost all documentation on the prevention and treatment of CoQ10 deficiency states has been performed with ubiquinone, and this includes research studies using Bio-Quinone capsules. At the molecular level, the difference between ubiquinone (oxidized CoQ10) and ubiquinol (reduced CoQ10) is not big. Ubiquinol has two extra hydrogen molecules and forms, in conjunction with oxygen, a so-called hydroxyl group on the head of the CoQ10 molecule, which is a quinone ring. The two forms of CoQ10, however, have quite different roles in the body. Ubiquinol donates electrons, whereas ubiquinone receives electrons. Ubiquinol performs an important function as an antioxidant in the body, but in the cells' energy producing mitochondria, the two forms constantly switch from the one form to the other - that is, from the oxidized to the reduced form and back again. Thus, one cannot say that one form of CoQ10 is more active or more important than the other. The two forms of CoQ10 also have different colors. Normal CoQ10 is a clear orange, yellowish substance, whereas reduced CoQ10 has a milky-white color. It is therefore easy to test whether the product you buy is normal or reduced CoQ10. The CoQ10 that we produce in the body's cells is oxidized CoQ10, whereas 90-95% of CoQ10 circulating in the blood is in the form of reduced CoQ10. CoQ10 from the diet consists of both ubiquinone and ubiquinol, about half of each7. Both forms are absorbed in the intestine along with fat. CoQ10 is slowly transported from the lymph into the blood. Already during the passage through the intestinal wall into the lymph, the absorbed ubiquinone is being converted into reduced ubiquinol. Consequently, there is no good reason to choose a product containing ubiquinol, as your body is able to absorb and convert ubiquinone from the gut to ubiquinol. The body is naturally able to reduce ubiquinone CoQ10 by itself. CoQ10 product's ability to be absorbed from the intestine is one of its most important aspects. Ubiquinone of good quality has been found to be absorbed just as effectively as ubiquinol. A few unsubstantiated reports suggest, however, that products with ubiquinol may be relevant to a very small percentage of people who have impaired uptake of CoQ10 from the gut. Finally, ubiquinol preparations are usually more expensive to buy than ubiquinone preparations. 10 - Do Cholesterol Lowering Drugs Reduce the Body's Level of CoQ10? Yes, you can read about the mechanism in textbooks on human biochemistry. Moreover, there is now a great deal of evidence from scientific studies on the consequences of this effect. The type of medication in question is commonly referred to as "statins". Statins are a class of cholesterol-lowering drugs that act by inhibiting the enzyme HMG-CoA reductase, which reduces the body's production of the substance mevalonate. From mevalonate, several substances are formed in the liver, including cholesterol and CoQ10. You cannot lower the body's cholesterol production in this way without also lowering its production of CoQ10. There are different types of statins working in different ways, and they are not equally strong. The most common complaint about the adverse effects of statins is muscle pain. The pain occurs when the muscles have to work with too little energy. However, not everybody experiences adverse effects from statins. The effect differs from individual to individual depending on how much CoQ10 is required to normalize the body's CoQ10 level during statin treatment. You must monitor your own body’s needs. 11 - How much CoQ10 do We Need? Our needs for CoQ10 are individual. Healthy young people usually have no need for supplementation of CoQ10. Healthy adults should take maybe 30 - 60 mg daily. Elderly people could take maybe 100 mg daily. People in therapeutic treatment have been given up to 300 mg daily - occasionally even more than that. 12 - How Long does It take for CoQ10 to Work? From the moment you swallow a CoQ10 softgel capsule, which is best absorbed with a meal that contains some fat, it will take 6-8 hours before the CoQ10 is emptied into the blood from the lymphatic vessels. There is also a threshold value for the blood level of CoQ10 that has to be attained before the tissue can absorb the CoQ10 sufficiently. This threshold value of serum CoQ10 has not been established with certainty, but researchers believe that it is approx. 2 - 2,5 ug/ml. In practical terms, this means that it is advisable to start with a slightly higher daily dose and then reduce the dose after some time if necessary. Take CoQ10 for at least a month, but do not expect maximum absorption in the tissue until after at least six months of use. 13 - What is the Source of Pharma Nord's Bio-Quinone Active CoQ10? Pharma Nord's Bio-Quinone Active CoQ10 is extracted from the content produced in specialized yeast cells, but the CoQ10 itself is completely free of yeast components. The reason for the use of yeast as a source of CoQ10 is that we can extract CoQ10, which is completely identical to the form that the body produces itself. Please be aware that there is also synthetic CoQ10 on the market. 14 - Do I Risk Infection from Mad Cow Disease from the Softgel Capsules? No. Pharma Nord's CoQ10 softgel capsules are pharmaceutical grade. They are made from cow hides. Risk material such as brain and spine are not used for gelatin production. Moreover, animals from risk countries are not used, and only the hide from cattle approved for human consumption is accepted. In addition, all animals are inspected before and after slaughter in an authorized slaughterhouse prior to approval. 15 - How can I Avoid Eating the Gelatin in the CoQ10 Capsules? You can cut a small hole in the softgel capsule with a pair of scissors and squeeze the contents of the capsule out in a spoon or directly into your mouth. 16 - Is the Gelatin used in Pharma Nord's CoQ10 Capsules Halal Certified? Yes. Pharma Nord buys the bovine gelatin for our CoQ10 products from a supplier whose gelatin is Halal certified. The certification comes from the Halal Department of the Islamic and Cultural Centre of Belgium. Mortensen SA, Rosenfeldt F, Kumar A, Dolliner P, Filipiak KJ, Pella D, Alehagen U, Steurer G, Littarru GP; Q-SYMBIO Study Investigators. “The effect of coenzyme Q10 on morbidity and mortality in chronic heart failure”: results from Q-SYMBIO: a randomized double-blind trial. JACC Heart Fail. 2014 Dec;2(6):641-9. doi: 10.1016/j.jchf.2014.06.008. Epub 2014 Oct 1. Alehagen U, Johansson P, Björnstedt M, Rosén A, Dahlström U. “Cardiovascular mortality and N-terminal-proBNP reduced after combined selenium and coenzyme Q10 supplementation”: a 5-year prospective randomized double-blind placebo-controlled trial among elderly Swedish citizens. Int J Cardiol. 2013 Sep 1;167(5):1860-6. doi: 10.1016/j.ijcard.2012.04.156. Epub 2012 May 23. Singh RB, et al. Effects on absorption and oxidative stress of different oral Coenzyme Q10 dosages and intake strategy in healthy men. Biofactors 2005;25(1-4):219-24. Can I get myoqinon in the US? Myoqinon, Pharma Nord's European registered ubiquinone CoQ10, used in the Q-Symbio clinical trial is also marketed under the trade name Bio-Quinone in some parts of the world. Our ubiquinone CoQ10 is marketed in the US as a pharmaceutical-grade dietary supplement under the product name Bio-Quinone Active CoQ10 Gold. It is an oxidized ubiquinone form of CoQ10 dissolved in vegetable oil, and it is the original, documented CoQ10 formulation used in 75 human clinical trials.